After months of preparation and hundreds or even maybe even a thousand emails, the 2012 CryoSat Validation Experiment otherwise known as ‘CryoVEx 2012’ finally kicks-off this week across the Arctic. Together with NASA colleagues and participating scientists from the USA, Canada and Europe, some remarkable airborne flights are planned later this week and early the week after. One of the highlights could come as early as tomorrow when the CryoSat satellite will pass over the Arctic Ocean from the north at about 7 km per second and pass almost directly over the Canadian military base Alert located at the northern tip of Ellesmere island. This provides an ideal occasion to fly directly under the satellite and collect valuable data from the onboard instruments on the real ice-conditions and ice thickness beneath both plane and satellite. For the moment, however, I’m in Greenland still travelling to the campaign location. Reaching the isolated Alert base is itself a challenge and typically takes two to three days or more, albeit through some interesting and spectacular landscapes. 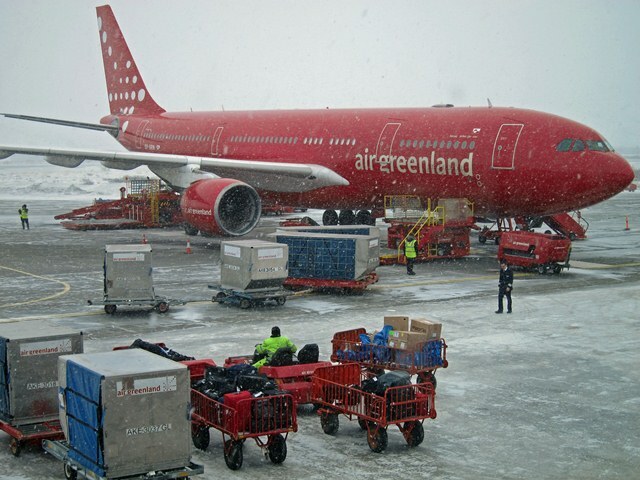 Landing in the main port of entry into Greenland – Kangerlussuaq – I was greeted appropriately by a snow storm as you can see in the picture of the ferry plane between Europe and Greenland. If all goes well I’ll be in Alert tonight or tomorrow evening. In the Arctic, however, you never know as weather can change quickly. Let’s see!